Russell Downes in the Navy at age 18. The Korean War broke out two years later. He was a young soldier, scared to death and unsure he’d get out alive. “When you see somebody shot beside you and he goes down, you try to help him — but he winds up dying,” Russell Earle Downes said of his time as a hospital corpsman during the Korean War. For years, Downes wasn’t able to talk about his war experience. Not until two decades later — in a classroom. He’s lived in Westwood for 55 years and taught physical education and health at Westwood High School and coached baseball there. Downes was inducted into the Massachusetts Baseball Coaches Association Hall of Fame in February 2006; and since May 2008 has been the namesake of the high school’s baseball field. 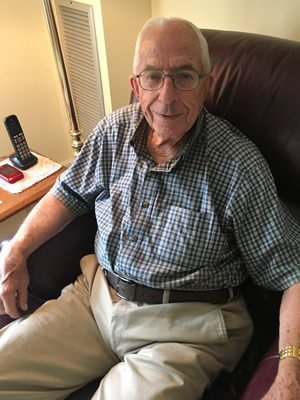 The Medford native didn’t have a direct path when he graduated from high school in 1948, so the 18-year-old Downes enlisted in the Navy and later was trained as a hospital corpsman, attached to a Marine unit. He trained at Chelsea Naval Hospital and later at Camp Pendleton in California before being sent to Korea when the war broke out in June 1950. He and his unit were shipped out to the landings of Incheon and Pusan and the march to the Chosin Reservoir. At first the weather was summer-like. As they marched to the north, temperatures dropped to below zero, conditions made worse, Downes said, because the military did not provide clothing suitable for that kind of weather. “My job was to do whatever I could to save their lives,” he said. He kept that up for the next three years, until the fighting stopped on July 27, 1953. After five years in the military Downes went to college on the GI Bill. He earned a degree in education at Boston University and a master’s degree from the University of Michigan. While Downes was looking for a job, a friend in Westwood recommended he speak with the superintendent of the Westwood schools and learned of a position in physical education. After three years teaching at elementary schools, Downes moved to Thurston Middle School, formerly Thurston Junior High, and eventually moved to the high school. He spent 35 years teaching, 31 of them coaching varsity baseball and different levels of basketball. When it became too difficult to handle all of the roles of an athletic director, he stepped down. He continued to coach baseball and basketball on weekends and went back to being a regular classroom teacher and coach. He retired from teaching in 1994. A fellow teacher running an after-school program at Thurston Middle School knew Downes served in the Korean War and asked if he could talk to the students about what it was like. The purpose of the program was to introduce students to things around the world. Guest orators spoke on topics such as spending time in the Peace Corps while others shared stories of their adventures around the world. At first Downes was reluctant, but finally agreed. “I did,” he said, “and it was really a blessing. I talked to the class what we did and how difficult it was to have started there with medical training and assuming you would just help the wounded but difficult to tell them, ‘you’ll be OK,’ but you knew they were going to die. Teaching changed his life, Downes says. He credits the war with helping him stay positive with the students he taught or coached. His compassion has held him in high esteem among his students. A postal worker for the past 19 years, Henderson was 6 when he first met Downes, who coached Henderson’s older brother for Westwood High’s baseball team. “He was my sponsor when I was baptized at the First Baptist Church in Westwood at 12,” Henderson said. Henderson also sat in Downes’ health and physical education classroom. “Everybody wanted him as our teacher as he was a fair grader and an absolute fun person,” he said of Downes. After high school Henderson became Downes’ assistant coach and junior varsity baseball coach. He was with him in 1988, when the baseball team won the south sectional title game, one of few championship teams Downes had. “Coach and I have done many breakfasts together and he always has the pulse of the town,” Henderson said. “He always is asking about past players and students. Downes was born April 11, 1930, and raised in Medford. He was the only boy between two sisters. One sister was killed in an automobile accident at an early age; the other sister is living in Medford. He has one son, Kenneth, and two daughters, Susan and Nancy. He has three grandchildren, Sam, Lauren and Isabelle. His wife Marilyn died three years ago. While he was teaching in Westwood he and Marilyn adopted a boy (Paulo Matos) from Brazil, who stayed at their home and attended the Westwood schools. Paulo still lives in the area with his family. As a little boy, Downes said he was always looking to do new things. He played sports. And he says he always had a sense of humor. “When someone asks me if I’m dressed up and ready to go out, and someone asks, ‘why didn’t you wear any underwear?’ I tell them because I can’t tell brief jokes. Joseph Gearon was a health and PE teacher at Westwood High when he met Downes, who was his boss. Years later, Gearon succeeded Downes as athletic director when Downes stepped down. Brian Whelan teaches health and PE at Thurston Middle School and was baseball coach at the high school from 2000 to 2015. “During that timeframe Russ would make an appearance on our bench as an honorary member of the coaching staff,” Whelan said. “As you know, baseball can be an extremely challenging sport to play. Russ was always there quietly on the end of the bench to pick all of the players’ spirits back up after an error or a strikeout. Mike Niles, a retired PE teacher at the elementary school level, was hired when Downes was a physical education teacher. They’ve remained close over the years. Soon after Downes retired he and Niles worked 30-second clocks at the basketball games along with Michelle Hebner, a retired middle school teacher who handled the scoreboard. After a while, Niles and Hebner told Downes, “You only can tell three puns. Only three. If you tell anymore, we’re shutting down everything and going away and leave you by yourself. Downes says memories of his experience in Korea no longer have a negative impact on his life today. But memories still rouse in his mind every time he hears a school bell ring.